MoProViewer is a molecular viewer dedicated to the charge density analysis field, linked to the MoPro refinement program suite and especially to the VMoPro program, which computes electron density derived properties. MoProViewer can be considered as a graphical interface to VMoPro as it allows to graphically configure a computation and to display the results. MoProViewer can display 3D isosurfaces, 2D isocontours maps, critical points and bond paths, electrostatic moments, gradient lines fields and topological basins. 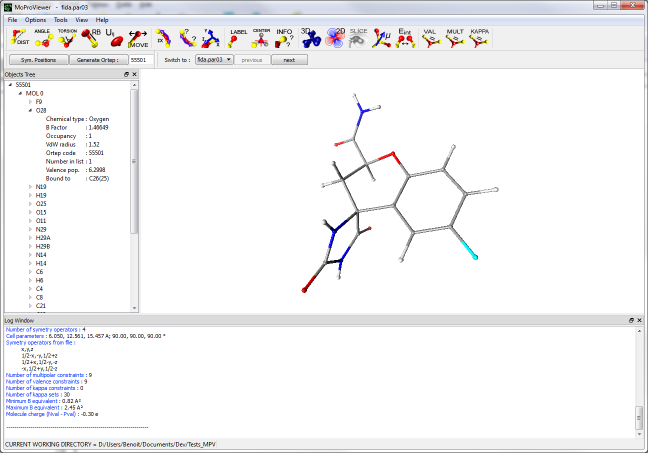 MoProViewer allows displaying a molecule, from various file types such as MoPro, PDB, CIF etc…, and to compute with the help of the VMoPro software properties related to the charge density modelling (static or dynamic electron densities, electrostatic potentials, critical points and bond paths etc…). The computed properties can afterward be displayed in MoProViewer. Then, MoProViewer can be seen as a graphical interface for the VMoPro program. Furthermore, MoProViewer can be used as a standard molecular viewer, allowing to display a crystal structure (including packing etc…) and to compute standard stereo-chemical properties, as inter-atomic distances, angles, torsion angles but also the so called rigid bond values based on anisotropic thermal motion modelling in the same way you can ask for the distance between two atoms. Of course, you can display thermal motion ellipsoids for any atoms in the model. MoProViewer can load directly MoPro and PDB molecular files, and XPLOR and CUBE files for properties. It also has an importation tool, allowing you to load CIF, MOLLY and POSCAR files through the Import2MoPro program, which is also part of the MoPro suite. For properties analysis, MoProViewer can show iso-surfaces of 3D scalar fields stored in XPLOR or CUBE formats, either by loading them from a file, or after a computation done with VMoPro. Once a 3D field has been loaded, you can display it, in 3D, using any isolevel, or you can explore it through a movable slant plane showing any section of the field. You can also compute and display the gradient field of the 3D property that has been loaded. MoProViewer can also display critical points and/or bond paths obtained after a VMoPro topological analysis, atomic local axis system needed for multipolar refinement, symmetry related molecules (and generate them as long as the crystal symmetry operations are known). MoProViewer is written in C++, on the basis of the Qt 4.8 (5.1 soon) library, and using libQGLViewer and Armadillo libraries for respectively openGL and linear algebra handling. Credits for the program can be seen using the “About” entry of the “Help” main menu. In MoProViewer, most of the tools appear in dialog windows that can be set as floating windows, or docked within the main window. This Qt capability (named QDockWidgets) allows the user to configure totally the program layout. Furthermore, user’s choices are saved and restored when the program is restarted.